We thought that we would continue on a skeletonisation theme this week, going from the ‘everyday wear’ type of watch to the other end of a spectrum, with two spectacular watches launched this year in editions of a mere three pieces each. Putting the ‘limited’ into ‘limited editions’, meet Louis Moinet’s Acasta and Dhofar, which we had the opportunity to see earlier this year. With the passage of time on Earth and her moon as their inspiration, the new (pink gold) Acasta and (white gold) Dhofar watches incorporate, respectively, a piece of Acasta gneiss rock and a piece of Dhofar 457, what is known as a ‘feldspatic granulitic breccia lunar meteorite, for their dials’. The latter, Found in 2001, is named after the region of Dhofar in Oman, near the Yemeni border in which it was discovered. 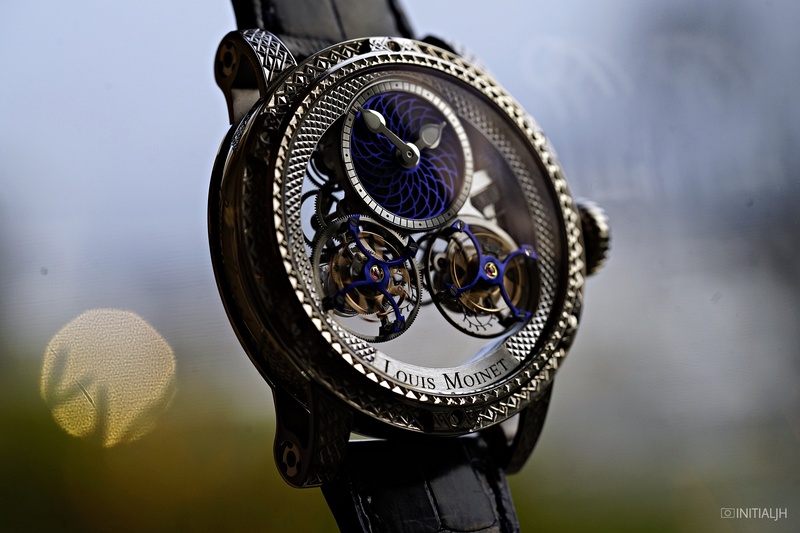 Louis Moinet are calling these two pieces “interstellar journeys”. LUN A is then divided into two types; anorthostic highland breccias (feldspatic breccias) and anorthostic brecicas (lunar highland breccias). The most scarce members of LUN A are the the first of these, and Dhofar 457 fits into this category. Now, you can have a fragment of this lunar meteorite on your wrist. It is by no means the only meteorite watch that has appeared in recent times, and we have covered a few of them, but there have been variations in how the meteorite has been used as well as how the result, looks. Now to the other piece. First noted in 1989, Acasta gneiss is named after the Acasta River near Canada’s Great Bear Lake, where it was found on an island that is part of the Tłı̨chǫ people land settlement. Radiometrically dated to around four billion years old, it is a fragment of some of the oldest known intact rock on Earth’s crust. It is comprised mainly of quartz and feldspar. The intricately engraved 47.4mm sized cases of both the Acasta and the Dhofar, in 5N pink gold and white gold respectively, are characterised by a new design with the two side shafts made from blocks of solid gold. Both pieces use the same manual-wind Moinet Calibre LM52 movement, which beats at 21,600VPH and has a fifty-two hour power reserve. What is notable about it is the two suspended inverted tourbillons that rotate in opposite directions. The large tourbillons, with a diametre of 14.9mm, were designed specifically to rise above the skeletonised movement, situated 1.75mm above the dial and weigh 0.4 grams each. They have blued titanium upper bridges and power a rotating open worked disc, which is also blued tinted titanium. Even if you don’t consider the meteorite and gneiss on these watches, they are still notable for this movement, and because they really have quite a presence both in size and stature. 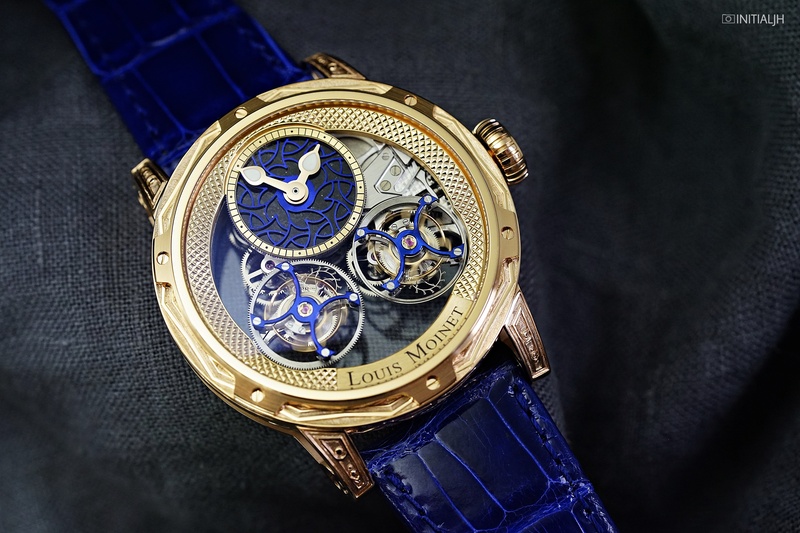 Their price, at 320,000 CHF, is as spectacular as the watches.